Q: In the communique issued on April 6 by the foreign ministers of the Group of Seven, they voiced strong opposition to any unilateral actions that undermine regional stability and the international rules-based order. They also encouraged China to participate responsibly in the free and open international rules-based system. What is your response? A: We have takennoted of relevant reports. For some time, the topic of the international system and international rules has been raised frequently worldwide. We believe it is good news that everyone wants to follow the rules, but we hope the relevant parties can specify what international system and rules they are talking about when they discuss them. What the vast majority of the international community uphold are the basic norms governing international relations based on the purposes and principles of the UN Charter, the multilateral system with the UN at its center, and the multilateral trading system with the WTO rules at its core. I can assure you they are what China upholds. If such international rules and system are what the G7 members have been standing for and if the G7 members also explicitly oppose unilateral actions beyond the UN framework, the international community including China will warmly welcome their efforts. Q: The French and German foreign ministers proposed creating an "alliance of multilateralism" while attending a UN Security Council meeting. They plan to officially launch this alliance during the 74th session of the UN General Assembly to be held in September this year. What's your view on that? A: We have noted relevant reports. China has been committed to upholding, supporting and practicing multilateralism. Against the backdrop of deeper economic globalization and multi-polarization and growing global challenges, the world needs multilateralism more than ever. During President Xi Jinping's recent visit to France, he and French President Emmanuel Macron, German Chancellor Angela Merkel and European Commission President Jean-Claude Juncker attended the closing ceremony of the Global Governance Forum co-hosted by China and France, where President Xi elaborated on China's proposition on upholding multilateralism, enhancing international dialogue and cooperation, working together against the deficit in governance, trust, peace and development and improving global governance. China supports the active efforts of the international community including France and Germany to uphold multilateralism, and stands ready to work with all sides to safeguard the international order and system with the purposes and principles of the UN Charter at the core, uphold the multilateral trading system with the WTO rules at its core, stay committed to multilateralism, establish a new type of international relations featuring mutual respect, fairness, justice and win-win cooperation, and build a community with a shared future for mankind. Q: The G7 foreign ministers issued a statement after their meeting, which welcomes the denuclearization plan that was talked about in the second DPRK-US summit, but regrets that the DPRK hasn't taken relevant measures. Besides, South Korean media reported that some entrepreneurs in the Kaesong industrial park recently applied for exemption from sanctions, but the requests were rejected by the US Department of State. What's your comment? A: After the US and DPRK leaders met in Hanoi, the international community indeed has been closely following the development of the settlement process of the Korean Peninsula issue, and it is even more true for the Chinese side. Like we said on many occasions, after the Hanoi summit, both the DPRK and the US have expressed their willingness to maintain dialogue. We think this is advisable and we hope that the international community will continue to support and encourage this positive attitude. In the meantime, such attitude alone will not suffice. The two sides need to meet each other halfway, take concrete measures to further enhance mutual trust and promote the political settlement of the Peninsula issue. China will continue to play a constructive role to this end. 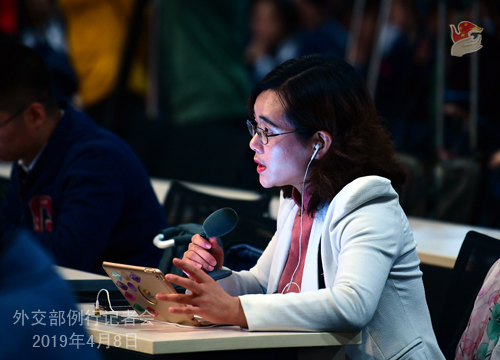 Q: Australian media is reporting that Yang Jun was questioned by Chinese agents on the matters related to Australia's probe into Chinese interference in domestic politics. Can you confirm this? What is your response to this report? A: We have no updates on the individual case of this individual Yang Jun you mentioned. 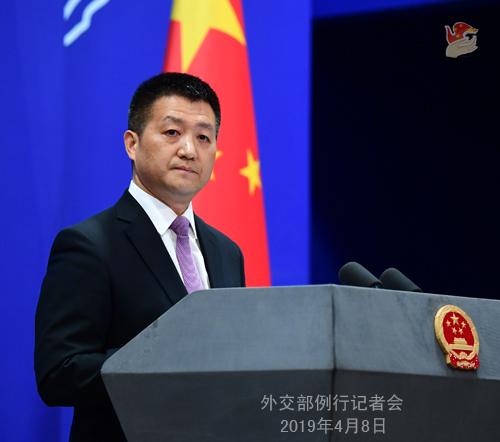 Regarding the relevant media reports you talked about, I would like to reiterate that when it comes to international relations, China believes that nations should respect each other's sovereignty and refrain from interfering in each other's internal affairs. Like we said before, we hope all governments can openly state their commitment to non-interference in each other's internal affairs. Q: Premier Li Keqiang has left for Europe and President Xi Jinping just wrapped up his visit to Europe in March. Two Chinese leaders have paid visits to the Europe within just two months, and the frequency is higher than before. Could you tell us why? Does that have anything to do with China-US trade talks? A: Thank you for your interest in China's diplomacy. Indeed, President Xi travelled to France, Monaco and Italy in his first visit this year. Premier Li Keqiang is travelling to Europe this time to attend the China-EU Leaders' Meeting and the China-CEEC Summit and pay an official visit to Croatia. Europe is an important force in the world and has been a priority of China's diplomacy. Strengthening the ties between China and Europe meets the aspiration of both China and Europe. As you can see in the outcomes of President Xi's visit to Europe, if China and Europe reach important consensus on upholding multilateralism and the rules-based international trading system, that will set the pace for the international community and I believe countries including Japan will welcome that. As to whether the strengthening of ties between China and Europe has anything to do with other parties, I don't see any necessary link here. Developing friendly relations with other countries has been our commitment all along and I think all parties will support and welcome such effort. Q: A recent commentary claims that less than half of the Chinese infrastructure projects in Pakistan under the Belt and Road Initiative have been carried out, that Pakistan has failed to turn massive lending by China into self-sustaining economic momentum and that it only heightened economic risks. The article also states that Pakistan says its current debt crunch is unrelated to Chinese loans and that China's assistance has played an important role in improving Pakistani people's living conditions. Do you have any comments? A: The China-Pakistan Economic Corridor (CPEC) is a flagship program of China-Pakistan cooperation in the new era and also an important pilot program under the Belt and Road Initiative. Over the past more than five years after its launch, the CPEC has yielded 22 early harvests, created tens of thousands of local jobs and met the power demand of 8.6 million households, significantly improving local infrastructure and people's well-being and naturally gaining recognition of the government and people of Pakistan. Leveraging international financing to carry out major projects, as a common practice across the world, is an effective way for developing countries in particular to overcome the funding bottleneck and boost growth. Of all current CPEC projects, only less than 20% are financed with Chinese loans, while the rest are all funded by direct investments or grants from China. Far from adding to Pakistan's burden, the CPEC has actually strengthened the local economic structure. We hope media agencies truly caring for Pakistan's development and its people's well-being will solicit local residents' views regarding the CPEC on the ground and then write reports on China-Pakistan cooperation based on the facts. Q: The British Counsel-General in Hong Kong expressed concerns to the SAR government over the ongoing legislative proceedings regarding the amendment of the Fugitive Offenders Ordinance. UK MPs in the House of Commons also plan to hold discussions on this issue. Does the Foreign Ministry have any response to these actions? A: We have answered many similar questions. This matter falls within the internal affairs of the Hong Kong SAR and China. No other country has any right to interfere. 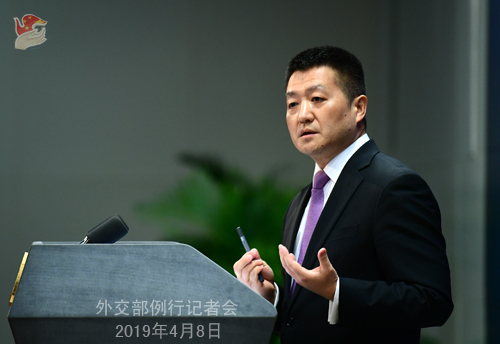 As to the SAR government's decision to amend the Fugitive Offenders Ordinance, the MFA Commissioner's Office in Hong Kong has made it clear that this is a necessary measure to facilitate Hong Kong's cooperation with other regions and countries. We are firmly opposed to foreign interference in China's domestic affairs using this matter as a pretext.